1. Change the color of the hand to the background color of any of the kids to change their symbol. Change the symbols to match their eyes. Change the hand to red, change the top symbol to match the eyes. Change the hand to white, change the left middle symbol to match the eyes. Change the hand to yellow, change the bottom left symbol to match the eyes. Change the hand to green, change the top right symbol to match the eyes. 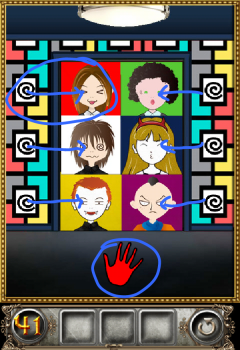 Change the hand to blue, change the right middle symbol to match the eyes. Change the hand to pink/purple, change the bottom right symbol to match the eyes. 2. Proceed to the next The Floor Escape level!